2 Solve the equation for b. 3 Solve the equation for h.
4 Solve the equation for h.
5 Solve the equation for w.
6 Solve the equation for . 7 Solve the equation for w.
8 Solve the equation for h.
9 Solve the equation for . 10 Solve the equation for z.
x + y + z = P Which variable am I solving for? 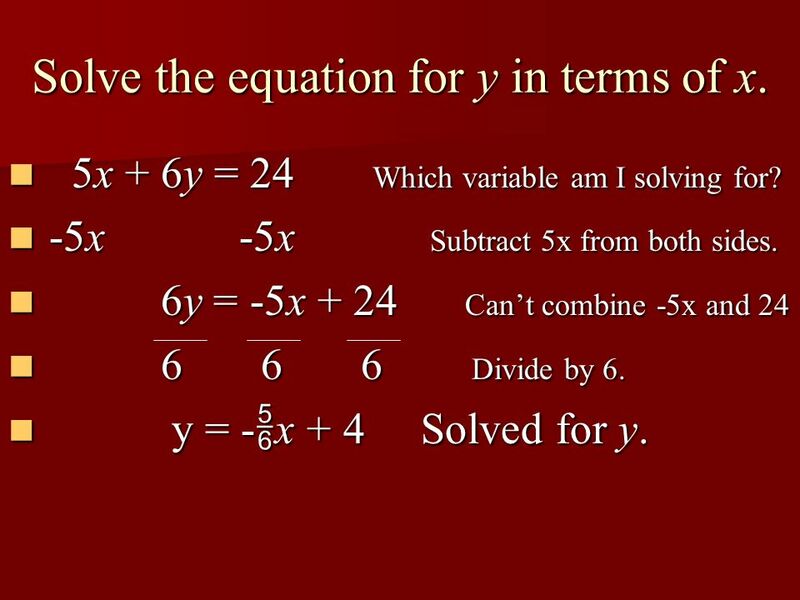 -x -y x -y Subtract x and y from both sides. 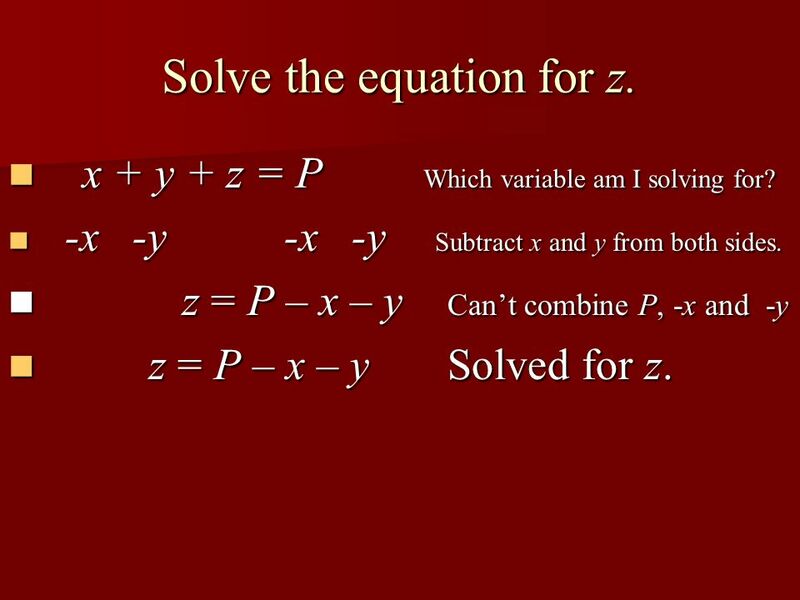 z = P – x – y Can’t combine P, -x and -y z = P – x – y Solved for z. 11 Solve the equation for n.
 - l= m Which variable am I solving for? +l +l Add l to both sides. 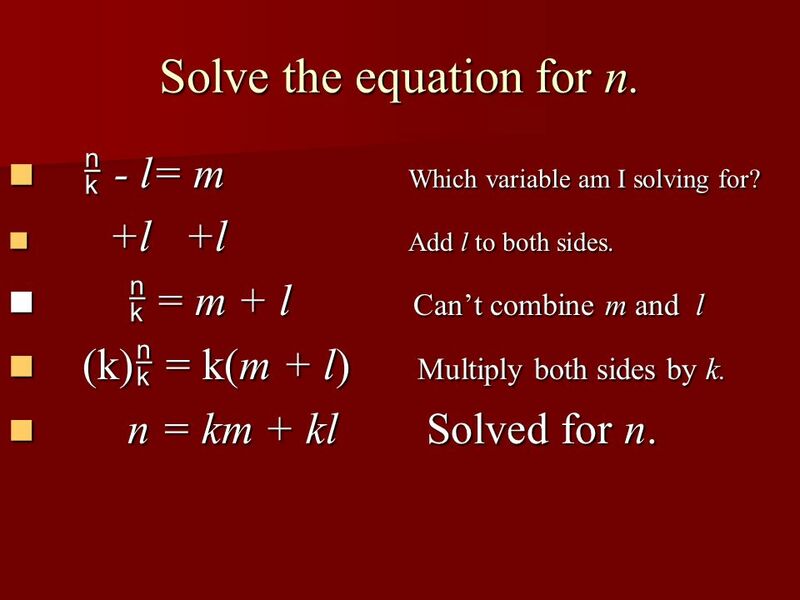  = m + l Can’t combine m and l (k) = k(m + l) Multiply both sides by k. n = km + kl Solved for n.
12 Solve the equation for y in terms of x. 5x + 6y = Which variable am I solving for? -5x x Subtract 5x from both sides. 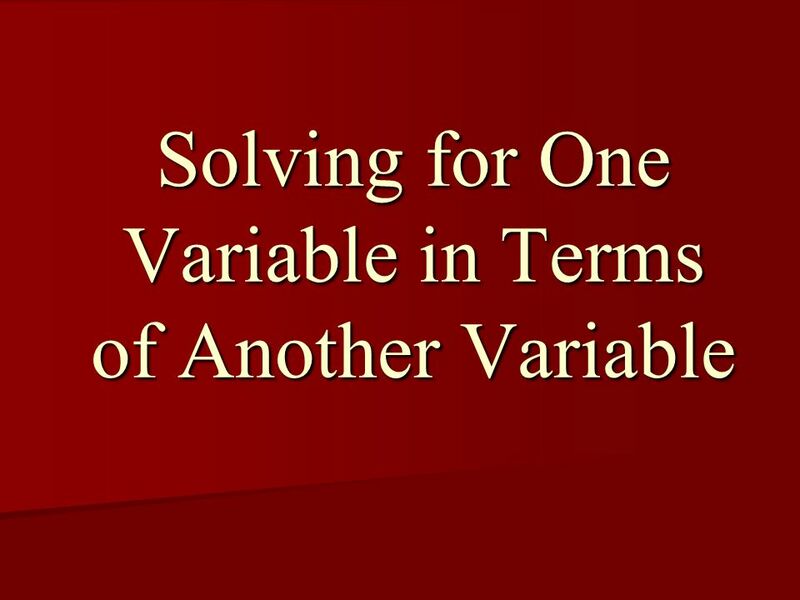 6y = -5x Can’t combine -5x and 24 Divide by 6. y = -x Solved for y.
Download ppt "Solving for One Variable in Terms of Another Variable"
3.3 Solving Multi-Step Equations. 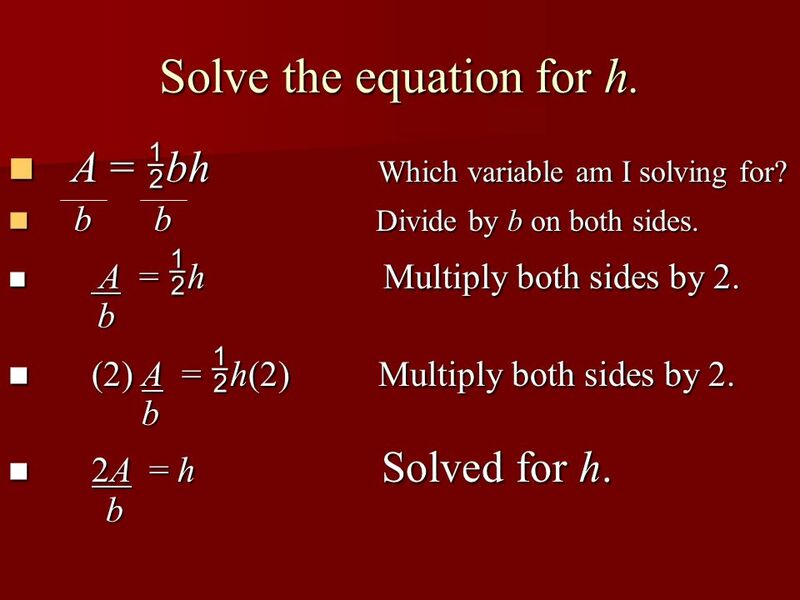 A multi-step equation requires more than two steps to solve. 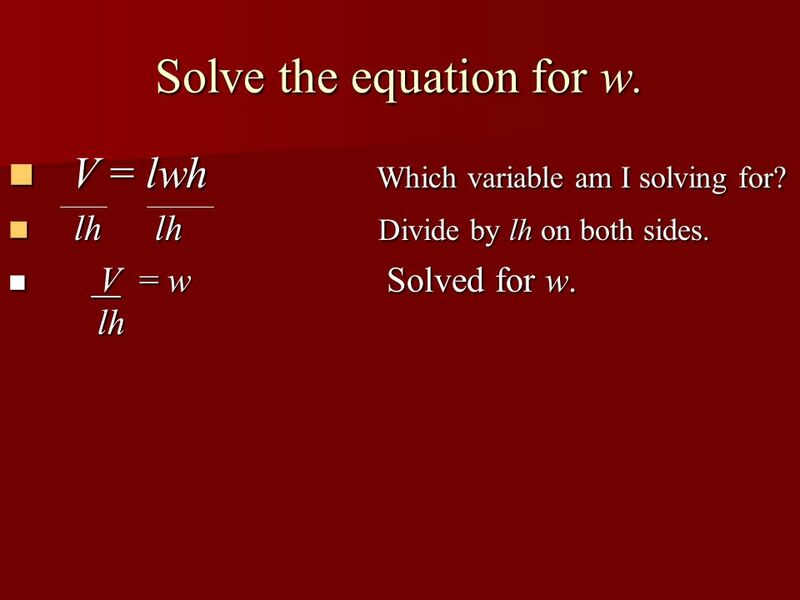 To solve a multi-step equation: you may have to simplify. 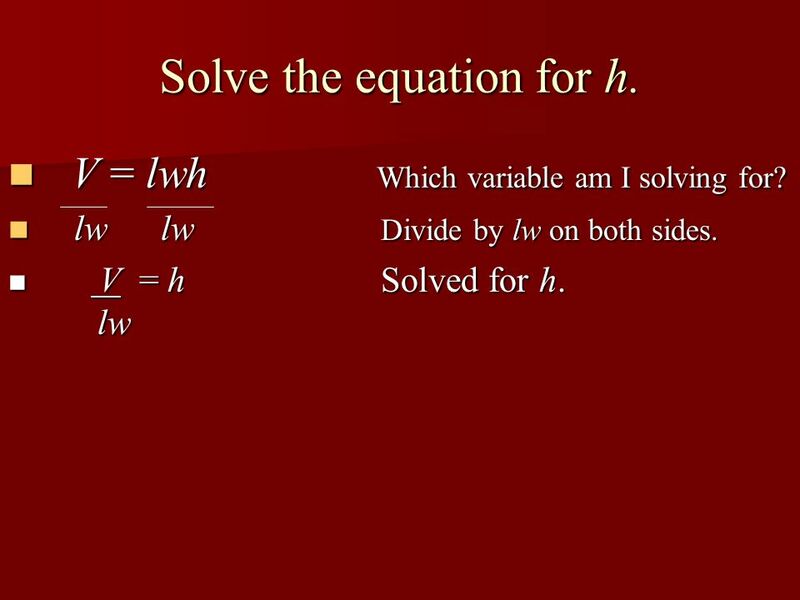 Solving Equations with the Variable on Both Sides Objectives: to solve equations with the variable on both sides. Math 025 Unit 5 Section 6.7. Example 2 4 m 8 m 5m 12 m x y. 3-5 Solving Equations with the variable on each side Objective: Students will solve equations with the variable on each side and equations with grouping. Intro To Algebra By: Carolyn Barone. 1.1 Linear Equations A linear equation in one variable is equivalent to an equation of the form To solve an equation means to find all the solutions of. 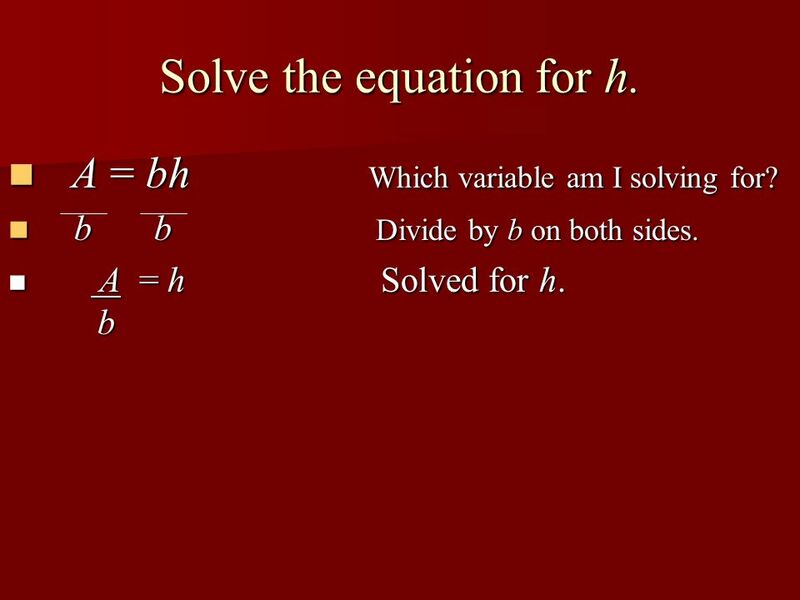 Solving 2-step equations ax + b = c. Keep it balanced Just like when solving a one- step equation keep it balanced. Just like when solving a one- step. Pre-Algebra 10-3 Solving Equations with Variables on Both Sides Solving Equations with Variables on Both Sides Pre-Algebra. Solving Equations with variables on both sides of the Equals Chapter 3.5. © 2007 by S - Squared, Inc. All Rights Reserved. 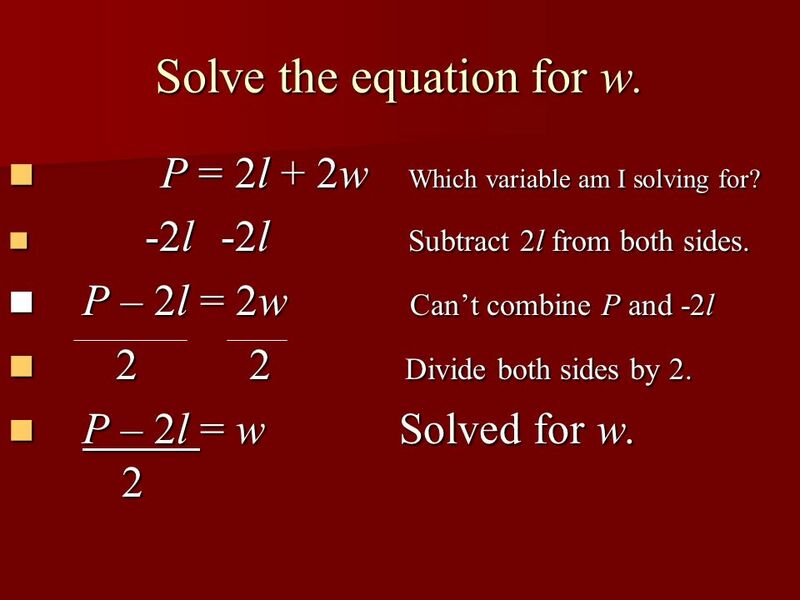  SWBAT solve two-step algebraic equations. 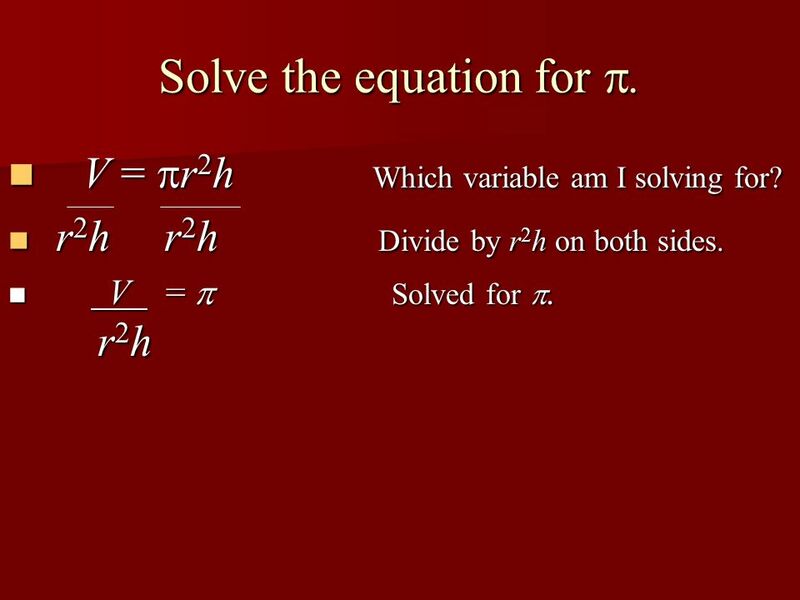  Two-Step Equations are equations that require two- steps to solve.  You will ADD or SUBTRACT and then. Solving Equations with Variables on Both Sides. 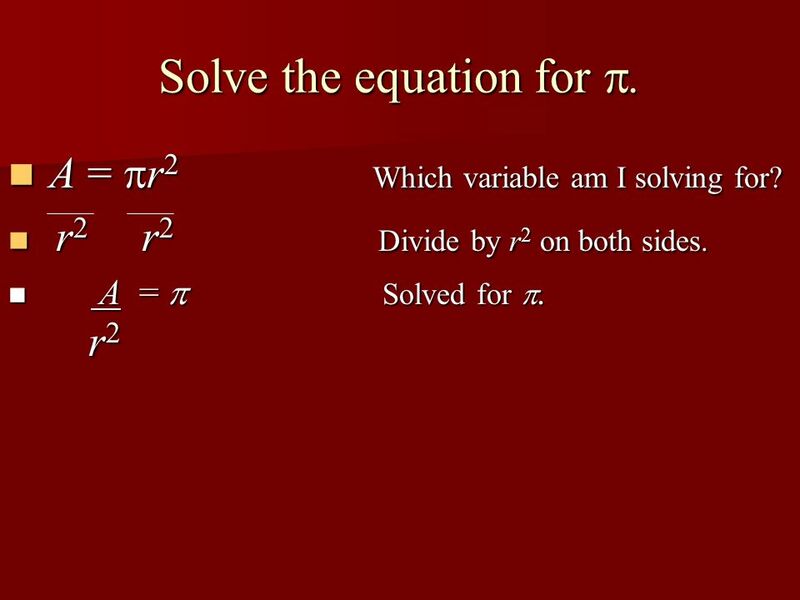 Review O Suppose you want to solve -4m + 5 +6m = -3 What would you do as your first step? Explain.